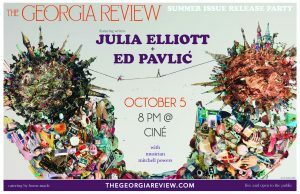 To celebrate the release of its latest issue, Summer 2018, The Georgia Review will host a reading by authors Julia Elliott and Ed Pavlić at 8 p.m. on Friday, October 5 at Ciné in downtown Athens. The event, which will include music by guitarist Mitchell Powers, is free and open to the public. A reception with light refreshments will follow the reading. Julia Elliott’s debut story collection, The Wilds (Tin House Books), was chosen by Kirkus, BuzzFeed, Book Riot, and Electric Literature as one of the Best Books of 2014, and it was a New York Times Book Review Editors’ Choice. Her first novel, The New and Improved Romie Futch (2015), also from Tin House, was a finalist for the Southern Independent Booksellers’ Alliance Prince of Tides Literary Award. Her writing has appeared in Tin House, The Georgia Review, Conjunctions, the New York Times, and other publications. She has won a Rona Jaffe Writer’s Award, and her stories have been anthologized in Pushcart Prize: Best of the Small Presses and Best American Short Stories. Elliott, who holds a PhD in English from University of Georgia, teaches English and Women’s and Gender Studies at the University of South Carolina in Columbia. Her short story “Hellion” appears in the new issue of The Georgia Review. Ed Pavlić has published eleven books. His forthcoming and most recent works are Let It Be Broke (Four Way Books, 2020), Another Kind of Madness: A Novel (Milkweed Editions, 2019), Live at the Bitter End (Saturnalia, 2018), and Who Can Afford to Improvise? : James Baldwin and Black Music, the Lyric and the Listener (Fordham University Press, 2016). He is Distinguished Research Professor in the English department and in the Institute for African American Studies at UGA. The Summer 2018 issue of The Georgia Review features a critical essay by Pavlić that offers a new framework for understanding the later work of poet Adrienne Rich. Mitchell Powers is a graduate of UGA’s music performance program, with an emphasis on classical guitar. He is also drummer and singer in the Americana rock band The Powers. Ciné, which defines itself as “the only independently operated, mission driven, non-profit, community-based art house movie theatre in the region,” is located at 234 West Hancock Avenue, Athens. In addition to its theaters and event space, Ciné also offers a full bar. See www.athenscine.com for more information.